These past five years have been increasingly challenging for all of us. I have witnessed a number of crises in my life in several countries and what caught my attention is the effect of those crises on people and the resulting changes in their lives and their relationships. We assume that decades of budo study and practice would bring us peace of mind and composure, but it’s rarely the case, especially for those of us who have been solely concentrating on the technical part and have been neglecting training our minds. We easily lose our vision and make irreversible decisions that will make it impossible for that vision to reappear in the future. 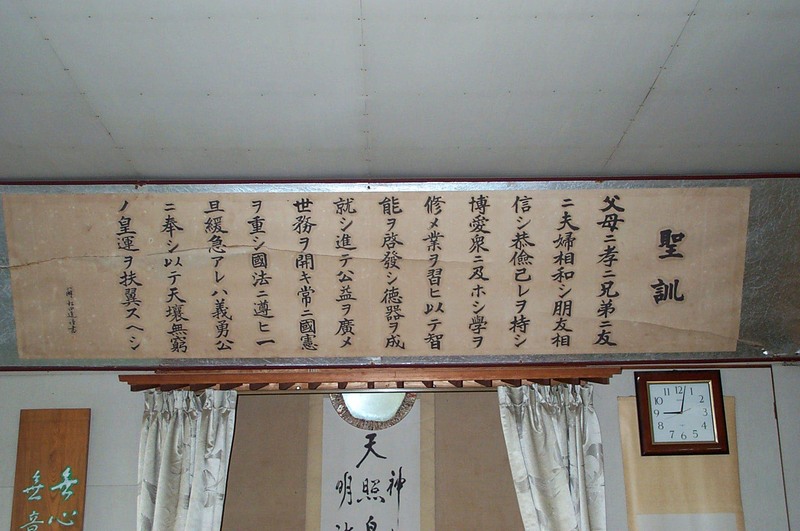 The sign above the old Yoseikan Honbu Dōjō in Shizuoka, Japan, said Samurai Gakkō (samurai school). The three qualities a samurai was expected to cultivate were duty, loyalty and courage. Put together, those three qualities constitute honor, the expression of the deep internal confidence that we live by our principles, respect our parents, our teachers, maintain the lineage for the next generations, manage the consequences of our decisions –good or bad, and always maintain our vision of what is important, whatever happens. With modern technology and its emphasis on convenience and speed came indifference to moral values and deterioration of ethics. Mochizuki Sensei believed that values and ethics had to be taught at an early age for people to be able to apply them to their daily lives. 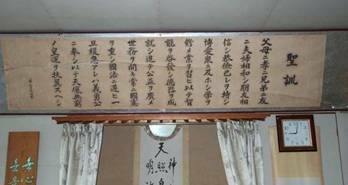 For that reason he made a simplified version of Emperor Meiji’s Seikun --which was written by the latter for the purpose of inspiring Japanese people during the crisis of the Meiji Restoration Period. He called it Budō Shōnen no Yakusoku (Junior Budō Student’s Promise.) Before ending every class, children were repeating the Promise after Sensei, and then had to explain and discuss it. In children’s case, they should first start from memorization. Understanding will come with regular exposure and practice. Children have a natural sense of justice; that is why it is so important to train them while that sense is still fresh. I came to this conclusion after teaching children and adults for thirty years. With children, I taught them how to behave in class and corrected them whenever necessary, expecting them to eventually apply those teachings at home and at school. Concerning adults, we’ve had regular mondo (question and answer periods) on Saturdays and during gasshuku (camps.) Most people at first are reluctant to think and talk about abstract subjects, but with exposure and practice, we can develop that kind of skill. However, I realized that with many adults, it had become a sort of intellectual game and that the really important teachings were going in through one ear and coming out through the other and therefore were not a serious part of their practice. This becomes evident whenever a crisis occurs: it’s what we really learned and practiced that comes out under stress. For that reason we Yōseikan teachers have been studying the Junior Budō Student’s promise with the children. While Mochizuki Sensei was alive and staying at the dōjō, we were all relying on him for directions. However after his passing, some monjin (students) who either did not value his teachings or did not understand them decided to drop them and go their own ways. It became evident to some of us that the Yōseikan was an endangered species and that we had to reassess our priorities if we were to make it possible for someone in the next generation to take over and continue those teachings. Consequently last spring we had a Shihan’s (master teachers) meeting at the Seifukai Honbu in Shizuoka, Japan under Mochizuki Tetsuma Sensei, Mochizuki Sensei’s second son. At that meeting I was appointed Overseas Operations Director. My duty consists in facilitating communications between Japan and other countries and making recommendations. Most of us started our Budō career as children or teenagers and have been maintaining our loyalty to our teacher and his teachings since that time. That is why we became aware of the importance of starting children early and vowed to dedicate our resources and energy to develop the next generation. Mochizuki Sensei constantly emphasized the importance of basics. Most people when unsupervised tend to focus on either learning new techniques or repeating what they have already learned ad nauseam. They may have learned basics a long time ago, but they no longer practice them nor teach them, so their aikido looks more and more like kakutogi (mixed martial arts) or like sloppy dance. It will deteriorate with each generation to the point of having no longer anything to do with the original teachings. That is what happens when students or teachers decide to go their own way in order to accommodate their personal needs. For that reason we must maintain the lineage. If we really understand what we are getting into, there is no sacrifice to be made, just readjustments. In order to understand, we have to practice, and teach, basics with an inquisitive mind. Understanding comes from doing. The same principle applies to training our minds. If in our daily lives we practice dealing with small challenges, then we prepare ourselves to deal with greater difficulties. So every little thing that happens becomes an opportunity to practice budō. Uncomfortable situations train us to accept discomfort and develop patience and tolerance, while comfortable situations train us to develop gratitude. One sure thing in life is that we get more of what we don’t want than the other way around; hence, the importance of forging our minds (seishin tanren) at an early age. Let’s give that chance to our children so that as adults they can live with peace of mind, composure and honor. May you continue to develop yourselves and may 2010 bring you more opportunities to do so. Kaoru Sensei and I vow to keep teaching those who have an unconditional desire to study and live by Mochizuki Sensei’s teachings. I will be spending the Holidays with my family in France. My parents are in their late eighties and have been very supportive. I dedicate this period of the year to them. I will also visit with my earlier teacher, Mr. Bourgoin, who was my mentor through my teenage years and prepared me to study with Mochizuki Sensei. Here is a link to the historical match at the 3rd World Judo Championships in 1961 between Mr. Anton Geesink and Mr. Michel Bourgoin which I would like to share with you. Geesink won the match and later thanked my teacher for bursting a painful furuncle which helped him win the tournament, and become the first Western world judo champion.